Wednesday November 11 is an Indian hoilday called DIWALI and it is also referred to as the FESTIVAL OF LIGHTS. 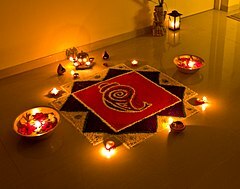 Diwali is an ancient Hindu festival celebrated every year. It is one of the largest and brightest festivals in India. The festival spiritually signifies the victory of good over evil. Please visit us at Aroma Cuisine of India for dinner on Diwali Day.